9 Apr 2019: 7:30 pm: New Leaves Literary Festival, GMU Fairfax, Fenwick Library Reading Room. A reading to celebrate my retirement from GMU & publication of my new book, The Avalanche Path in Summer. To celebrate our MFA program, and the great continuity of woman poets, I’m pleased to be joined by alum J.K. Daniels, whose first book, Wedding Pulls, was selected by the late C.D. Wright for the New Southern Voices Poetry Prize. Saturday, 23 Mar 2019: Poet as Witness, a Poetry Society of Virginia festival, 10-4, Northern Virginia Community College, Annandale campus. Activities begin at 10:00. From 11:00-12:00 I will take part in a reading & conversation with poet Kathy Smaltz. After a lunch break, E. Ethelbert Miller will read at 1:00, followed by an open mic. 8333 Little River Turnpike, Black Box Theater (CC115). Free parking in the B lots. 14 Aug 2018: “To Speak of One Is to Speak of the Other,” my limited edition broadside from Tupelo Press, is now available on line. If you would like to purchase a signed copy, please contact me directly through this site. 17 Mar 2018, Artists & Poets: Freedom of Expression, Freedom of the Press. Artist reception & poetry reading, 4-7 pm, Epicure Cafe, 11104 Lee Highway, Fairfax VA. This event is part of the annual remembrance of the bombing of Al-Mutanabbi Street, Baghdad’s legendary street of booksellers. The art exhibit is open 24 Feb-31 March. 15 Feb 2018: I’m pleased to announce that “To Speak of One Is to Speak of the Other,” a poem from The Avalanche Path in Summer, is one of three winners of the first Tupelo Broadside Prize. You can read the poem in Tupelo Quarterly #14. The Broadside is forthcoming. 19 Oct 2017: “In the 15th Chapter on Infinity, Try to Arrest One Detail,” a poem from Avalanche Path went public yesterday at Terrain.org: a journal of the built + natural environments. If you don’t know this journal, you should. Sept 2017: Four poems from The Avalanche Path in Summer (f/c Fall 2018, from Ahsahta) are included in a stellar new issue of Free Verse. Many thanks to Jon Thompson for including my work with so many poets I admire. July 2017: I’m excited to say I will be traveling in Shetland, then in residence for a week at Timespan, a cultural and arts centre in Helmsdale, Sutherland, along with my friend and colleague, the folklorist Margaret Yocom. March 2017: 1:30-3:00. “Violence & Silence: the influence of Susan Howe on Trafficke,” for the panel “Susan Howe & the Politics of the Archive.” Northeast MLA Conference, Baltimore. Feb 2017: two poems from The Avalanche Path in Summer + six prose poems from Suibhne on Eigg: A Dictionary of His Days & Nights in the new issue (4.1) of Plumwood Mountain: An Australian Journal of Ecopoetry & Ecopoetics, guest-edited by Harriet Tarlo. Feb 2017: 12:00-2:00. “Flying Words,” artists’ talk & poetry reading commemorating the bombing of Al-Mutanabbi Street, Baghdad. Fenwick Library, GMU. 21 December 2016: I am thrilled to announce publication of The Alabama Black McGruders: The Life and Ancestry of Charles McGruder, Sr., by J.R. Rothstein. I congratulate Mr. Rothstein, and am proud to host this remarkable history on my website, Magruder’s Landing. A great-great-great grandson of Charles Magruder / McGruder Sr., J.R. Rothstein has worked for years to piece together written records, oral histories, and DNA evidence to create both a plausible narrative of Charles’ life and origins and an open-sided platform for further research, debate, and community. His introduction lists seven collaborators who contributed in various ways to the realization of this work, as did the many family members who preserved family stories over the last 200 years. J.R. and I are descended, respectively, from Ninian Beall Magruder and Samuel Magruder, two grandsons of 17th c. Scottish immigrant Alexander Magruder, subject and catalyst of Trafficke. October 2016: “Another Haunting, the Pencil Line,” a poem from The Avalanche Path in Summer, is included in the Fall issue of Copper Nickel. Many thanks to editors Wayne Miller, Brian Barker, & Nicky Beer. Monday, 26 September 2016: Fall for the Book festival, George Mason University. “Slavery and Beyond: Recovering History through Family Memory,” discussion with author Karen Branan and historian Anthony Cohen. 3:00-4:15. Building: Research 163. Public parking in the Mason Pond deck. 15 July 2016: Thanks to Jon Curley for an insightful and historically informed review of Trafficke, at Galatea Resurrects. I’m happy and surprised when anyone takes the time to actually read this monster of a book, much less review it, and Jon’s eloquence on Trafficke‘s behalf is humbling. Disturbingly, however, the review failed to mention Trafficke‘s ultimate ethical core: my family’s 200 years of slave holding. What happened next was terrific, though– read the comments, and Jon’s responses, and see what can happen when readers engage, speak up, and turn what could have been just another moment of American racial blindness into a real conversation. We all have to learn this way: the hard way, and sometimes in public. See my part in this exchange for proof I am not excluding myself from that indictment. Tuesday, May 24 @ 7:00: Reading from Trafficke, with Karen Branan, author of The Family Tree (Simon & Schuster, 2015) @The Potter’s House, 1658 Columbia Road NW, a D.C. institution since I was too young to drive. Come early, have dinner, buy a book… NOTE THE NEW DATE. 2 May 2016: My deepest gratitude to Martha Collins for her essay/review: “The Documented I: review of Philip Metres’ Sand Opera & Susan Tichy’s Trafficke.” In Field: Contemporary Poetry and Poetics No. 94 (Spring 2016) 65-73. Print. Available for purchase/download: Spring 2016 issue of Field. Thursday, April 14: 2016 Split This Rock Poetry Festival: Poems of Provocation & Witness, April 14-17, Washington D.C. I’ll be part of a panel, “Migration & Identity: Interrogating Privilege through Poetry.” Thursday, April 14, 2:00-3:30, in the AFL-CIO Building, Gompers Room [Map]. I will read briefly from Trafficke and talk about the research, the Magruder history, and our responsibility to the truth of our personal family histories. My fellow panelists are Marcos L. Martinez, Sean Pears, & Benjamin Brezner. Open to all, though you must register to attend festival events. See the web site for reduced rates to students and those with low income. 12 March: Two poems from the new manuscript, The Avalanche Path in Summer, have popped out on line in recent weeks: “A Walk Is Fact for the Walker and Fiction for Everyone Else,” was Poem of the Week on The Missouri Review site, 22 Feb, and “Route Sketched on a Map, as if Walking” appeared in Plumwood Mountain: an Australian Journal of Ecopoetry and Ecopoetics. It’s a lovely journal–check it out. Sun, 28 Feb 2016: 2:00-3:30. Reading from Trafficke, with Karen Branan, author of The Family Tree (Simon & Schuster, 2015), her investigation of a “kinship lynching” within her family in Jim Crow Georgia @ The Writers Center, Bethesda. 27 July: Three new poems in the summer issue of Beloit Poetry Journal–hey BPJ, thanks, as always, for supporting my work. 23 July: Quiddity has put my interview about Trafficke on line, along with an excerpt from “In Purpose at My Booke.” Read it there, or download. Fri, Apr 10, 3:00-4:00: Signing books @ George Mason University tables in the book fair, #1306 & 1308. 15 Nov: Something I forgot to post: a short conversation about Call & Response, featuring Helen Frederick (my co-curator) and Anne Smith (Fenwick Gallery Graduate Assistant) and myself, on the Fenwick Gallery blog. Video Highlights from the Call & Response gallery talk, with comments by Benjamin Brezner & Sarah Zuckerman; Qinglan “Q” Wang & Alice Quatrochi; Rahshia Sawyer & Sarah Winn; Sean Pears & Marianne Epstein; Marcos L. Martinez & Ariel Rudolph Harwick. Recorded on 17 September 2014. Bethel in the Green Mountains, artist book by Marianne Epstein & Sean Pears. Call & Response 2014. 6 Nov 2014: Read about Trafficke, my forthcoming book from Ahsahta Press. 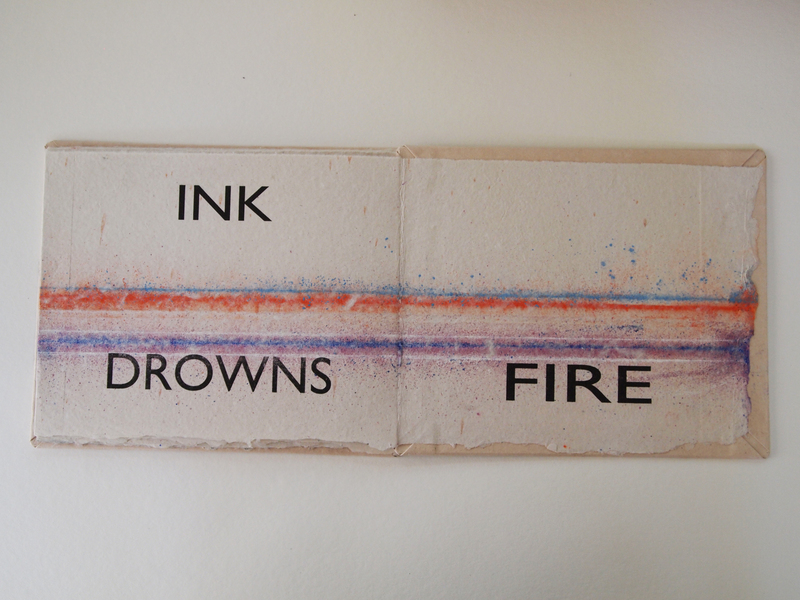 River of Lanterns/River of Lights, sculptural book & poem text by Alice Quatrochi & Qinlan Wang. Call & Response 2014. September 2014: “Only Allowed One Step at a Time” has just appeared in the Fall issue of Beloit Poetry Journal, my oldest home in the poetry world. April 2014: an excerpt from “Hairst” has just come out in Seneca Review‘s Beyond Categoryissue, keeping company with other surprising and provocative works dwelling on the various edges of genre. Buy the print issue, check out additional works in Beyond Category Online. “Hairst” is from Trafficke: an autobiography, forthcoming from Ahsahta Press in March, 2015. This workshop will give poets who have just begun to write about race (or just begun to think about it) a chance to consider ways of approaching racial subjects in poems. Facilitated by two white poets who have themselves written a great deal about race, the workshop is open to everyone. We will examine published poems that deal with racial subjects from a variety of perspectives (including the personal and the historical), and use a variety of poetic strategies; we will also consider some poems by white poets that are unintentionally racial. [Like, perhaps, the subtitle of our workshop?] We will then invite participants to write down responses to a series of questions that will help them to see themselves and their experiences in racialized terms and to suggest ways of approaching those experiences in writing. In the time that remains, participants will share these answers, which we hope might become starting points for poems. 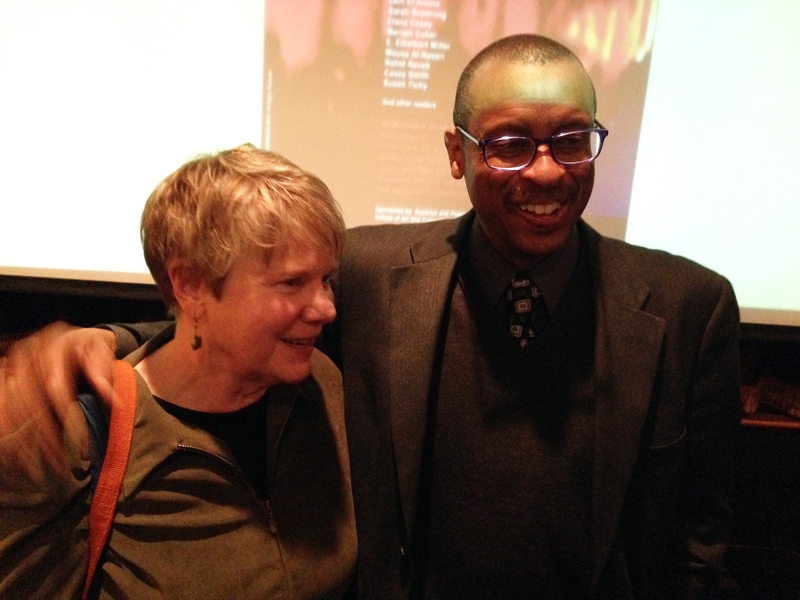 With Ethelbert Miller, at the Al-Mutanabbi Street reading, March 5. 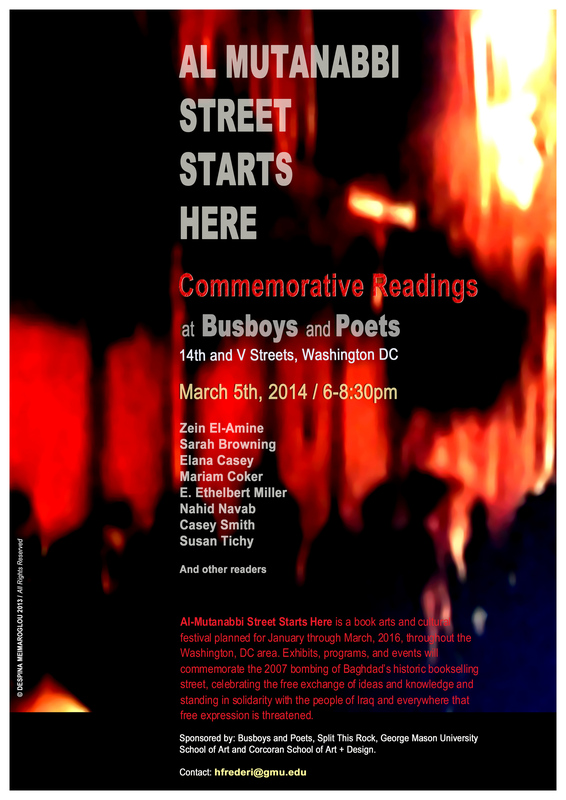 5 March 2014: I will be part of a poetry reading at Busboys & Poets, commemorating the 6th anniversary of the bombing of Al-Mutanabbi Street, Baghdad’s center for booksellers, writers, printers, and intellectual life. Commemorative events honor the dead and continue the struggle for free expression of ideas, worldwide. 6:30-8:30, Busboys & Poets, 14th & V Streets NW, Washington DC. Another section of “Hairst”–from Trafficke–is forthcoming in Seneca Review, “Beyond Category” issue, due out in March 2014. Events & exhibits at George Mason University & throughout the Washington metro area, Jan-March 2016, will conclude the Al-Mutanabbi Street Starts Here project. Planning has begun, so get in touch if you want to be part of it. Schedule of Al-Mutanabbi Street Starts Here exhibitions through 2016. Sept 2013: Last May I collaborated with my friend and colleague Helen Frederick on three invited artist books for Al-Mutanabbi Street Starts Here, the ongoing response by artists to the March 2007 bombing of Baghdad’s Al-Mutanabbi Street, a center of bookselling, printing, and intellectual life. San Francisco poet and bookseller Beau Beausoleil began the project with a handful of artists and print-makers. Today so many artists are involved, and so many venues asking for an exhibit, that the works are divided among two touring collections and a permanent collection in a Baghdad library. Thus, three books: one for each collection. Each of our three books, Those Driven Mad by War I, II, & III, is distinct in its materials, concept, and use of text. The book pictured here is included in a small selection currently being exhibited in Cairo. * Paper by Peter Winant / Text by Susan Tichy w/ found text by Lutifiya al-Dulaimi / Design & printing by Helen Frederick. 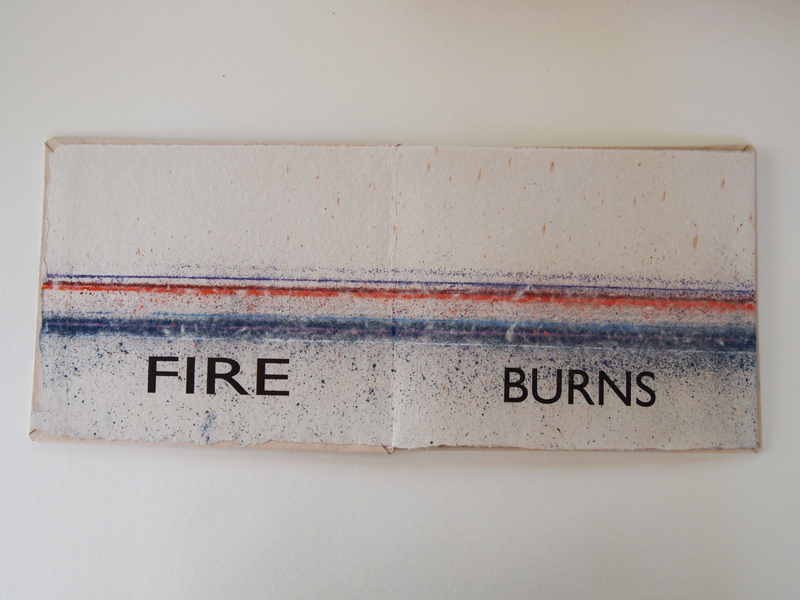 My text: Fire burns paper, paper absorbs ink, ink drowns fire. The pulled text is adapted from this passage by Lutifiya Al-Dulaimi: Those driven mad by the cruelty of war would wander up and down, reciting classical poetry…or yelling out mock news broadcasts, that tore through the silence of writers and booksellers, from her essay “Al-Mutanabbi Street,” collected in Al-Mutanabbi Street Starts Here, edited by Beau Beausoleil & Deema Shehabi (PM Press, 2012). Mike Newton’s review in The Indypendent describes the exhibit that just closed in New York, and mentions our book. Al-Mutanabbi Street Starts Here will come to GMU and the greater D.C. area in spring of 2016. Nov 23: Many thanks to the editors at Cerise Press, who have nominated my poem “Geologue Picks Up a Pebble and Says to Us, See!” for a Pushcart Prize, Best of the Small Presses Volume XXXIX. Oct 24: at high noon: a short talk & reading from my own work at the Library of Congress, in a celebration of the poet Denise Levertov (Literary Birthdays series). LOC Center for the Book. Whittall Pavilion, Thomas Jefferson Building. * This event has been postponed… until Oct 24, 2014. Sept 16-27: Call & Response IV: Parallel Lives – an artist & writer collaboration curated by Helen Frederick & Susan Tichy, sponsored by Fall for the Book Festival. 123 Gallery, Johnson Center, GMU, Fairfax, VA.
Sept 14:Sweeney: Susan Tichy goes live, part of Alec Finlay’s Sweeney’s Bothy / Bothan Shuibhne project…which, in turn, is part of The Bothy Project, building creative retreat huts in various wild parts of Scotland. On Alec’s blog, scroll down the links at right to find a cluster of pages beginning with Sweeney–all part of this project. 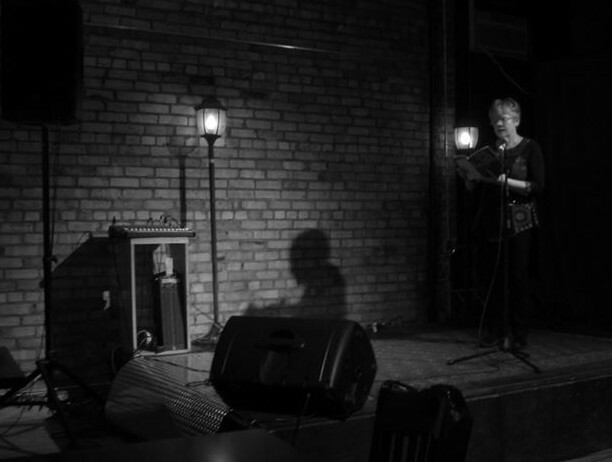 Sept 12: New Poems on a new site – Spacecraftprojects, launched by Gillian Parrish. “Tent Book,” “Rockfall on a Cliff Hidden by Trees,” “The Mountains Flew Over the Water as Birds,” & “At a Rockfall Ending in Willow, a Larkspur Taller than Willow” keep company there with poems by Michael Palmer, Alec Finlay, Dan Beachy-Quick and others, plus interviews with Susan M. Schultz, musician Pauline Oliveros, and dancer Kirstie Simson. Tea moons, tea paper, & mesostic poems are my contribution to this exploration of contemporary concepts of the book. (For a peek, check out the tea moons on my Ephemera pages.) Curated by Ceci Cole McInturff. Workhouse Art Center, Vulcan Gallery, Lorton, VA. Reception w/ readings and performance: Saturday, September 14, 6:00 pm. July 3: An excerpt from ‘Hairst”–from Trafficke–has just gone live on Evening Will Come, along with an essay “Equal Meadows” on the influence of Susan Howe and Czeslaw Milosz on the book’s conception. It’s an issue on Mixed Form, edited by Peter Streckfus and including work by Jessie Ball, Martine Bellen, Julie Carr, C.S. Giscombe, Joyelle McSweeney, and Cole Swensen. May 12: Djelloul Marbrook has written a much-deserved paean to Janet Holmes and Ahsahta Press, including a generous review of Gallowglass, in Galatea Resurrencts #20. This review is especially pleasing for its focus on the connection between poetic method and ethical content, and I am honored to be in the company of Dan Beachy-Quick, Kate Greenstreet, Brian Teare, Stephanie Strickland, Andrew Grace, and Elizabeth Robinson. “I’ve never encountered a poetics so sustainedly hypnotic, like a malarial fever trance. The fever is our collective memory of the Vietnam, Iraq and Afghanistan wars, wave after wave afflicting our efforts to carry on our lives, a past that wells up in us when we least expect it. Read more here, and visit Djelloul Marbrook’s blog. Alas & alack! Snow has canceled my plans and I will not be in Boston. Three members of the panel expect to make it, though, so the show will go on, and I expect someone else will read my bit. If you, too, find yourself unexpectedly at home this weekend, check out BPJ’s Poet’s Forum and join a discussion of the long poem. A short reading from Trafficke: An Autobiography (my current book project) + discussion of my research into 200 years of slaveholding in my family. R227. 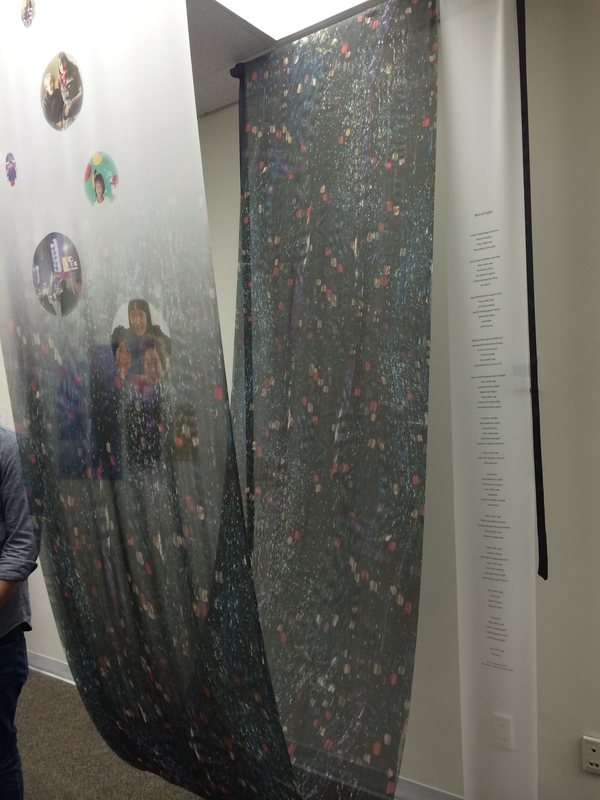 Research and Community Activism in Creative Writing: Spiral Paths. (Margaret Yocom, Quraysh Ali Lansana, Philip Metres, Debra Lattanzi Shutika, Susan Tichy) Poets and writers will read from their work and discuss their varied research methods and writing projects that engage them and, often, their students in community activism: walking one’s neighborhood to interview, observe, and write; ethnographic fieldwork in an urban, multicultural, immigrant area; service learning, including interviews and performance pieces; archival research (for a book and website) on enslaved families once owned by the writer’s family; and grassroots museum work with local cultures. “That the Earth Is Not Only Supported by Their Strength but Fed by Their Ruin,” a mesostic poem about & from the works of John Ruskin, in new Long Poem Issue of Beloit Poetry Journal. In March, I’ll be joining A. E. Stallings, Philip Metres, Bruce Bond, Dawn Porter, & Margaree Little on BPJ’s Poet’s Forum for a discussion of the long poem. Please join in! “A Scottish American Identity: History, Legends, Lies & Discoveries,” a short talk + reading from my current book project, Trafficke: An Autobiography, at Hylton in the Highlands: A Festival of Scotland, Hylton Performing Arts Center, Manassas, Virginia. $15 admission for the day, including a performance & talk on the piobaireachd tradition by Bonnie Rideout. I share the 1pm slot with Scottish folklorist Joy Fraser. With my collaborator, Brandon Moore-McNew, I will be showing Mapping Afghanistan, poems and an artist book printed on paper we made from Brandon’s uniforms, during the Arts + Military + Healing workshop in May. Arts, Military + Healing: A Collaborative Initiative. Events at Washington, D.C. venues & at GMU, May 13-18 :: workshops, exhibits, film, dance, paper-making & creative writing. I will be taking part in Paper-making as Therapy for Trauma, at GMU May 14-18. Read about Combat Paper. Book Beasts Show & Reading : Thursday May 10! WHAT? 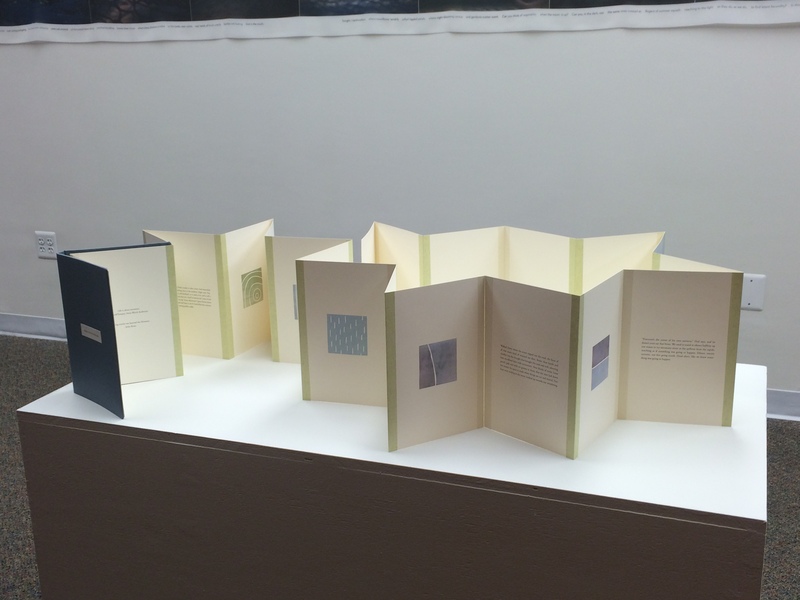 Book Beasts show : artist books, visual poems, conceptual writing. WHERE? English Department Conference Room, Robinson A-447. WHEN? Thursday, May 10, 5-7 pm, reading & presentations 6 pm. WITH? Food! Also the students of this year’s Book Beasts workshop. WHY? Because poetry can’t always be trapped on the page. Friday, May 4: Fair Use in Poetry – a panel discussion with David Fenza, Peter Jaszi, Casey Smith, & Susan Tichy. The Pew Charitable Trusts Conference Center, 901 E. Street NW, Washington, D.C.
Split This Rock: Poems of Provocation & Witness, March 20-25, 2012, Washington, D.C.
Saturday, March 24: White Poets Writing About Race: An Invitation to Conversation – a roundtable with Martha Collins, Ailish Hopper, Tess Taylor, Susan Tichy, and Jake Adam York.